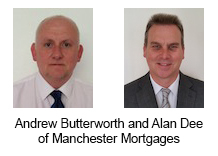 Manchester Mortgages (Alan Dee and Andrew Butterworth) were born in and have lived in Manchester all their lives. With over 40 years of local mortgage brokering experience in and around Greater Manchester, their knowledge is exceptional, allowing them to provide the best advice and best mortgage deals in the Greater Manchester area bar none. Located across the Greater Manchester area, Manchester Mortgages have over 40 years of brokering mortgages and providing mortgage advice to people from all walks of life. We are frequently able to secure mortgage agreements from lenders where other brokers have failed and obtain mortgages for our customers at far better rates of interest than the high street banks.